Ryan Murphy just announced the subtitle of the next season of his horror-anthology series, American Horror Story. The 9th season will be called '1984'. This would be the first time a season has been numerically subtitled. The revelation was made with a small teaser, which gives us the hint that the new season could be dabbling with the idea of slasher films. 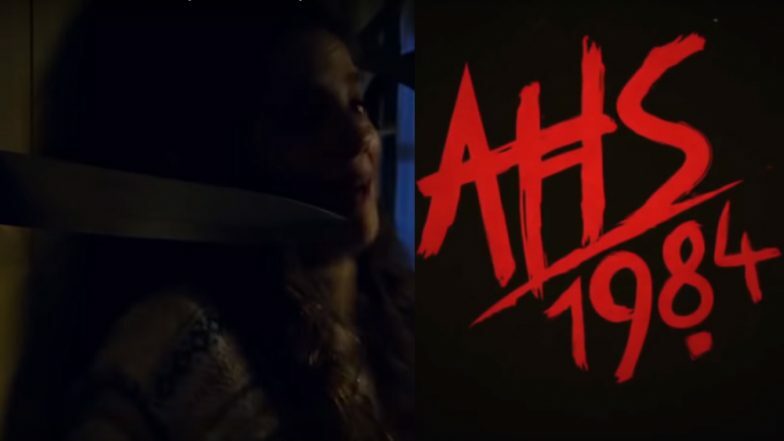 American Horror Story 1984 could be paying homage to the slasher-horror movies that came out in the '80s. And there are a lot. Starting right from Friday the 13th that released in 1980. We can't wait for more details from the new season to be revealed. Pet Sematary Movie Review: Jason Clarke’s Film Is an Unsettling Blend of Horror and Grief. The first teaser of American Horror Story 1984 begins with a girl running through the woods. She is being chased by an unseen killer (only the lower half of his body visible on the screen). She reaches a cabin and locks herself in only to make the killer stab the door, the knife slicing through the wood sending the girl screaming. "Don’t put anything past us," is the official synopsis of the new season. The series has won multiple Emmys in the past. The titles of first 8 seasons chronologically were Murder House, Asylum, Coven, Freak Show, Hotel, Roanoke, Cult and Apocalypse. It has been established over the years that all the seasons are connected in some ways. We are totally wondering how American Horror Story 1984 will be placed in the AHS universe.